You may wonder why a mousemat ever needed to be reviewed such as the SteelSeries QcK and QcK+ Limited Edition. The thing is, mouse mats have come a long way since the days of those spongy blue ones we all had in IT class. They look better, are made of more improved materials and are specially designed to work with the lasers in your gaming mice for improved accuracy and precision. A decent gaming mouse mat or surface is the difference between getting that headshot or missing it. The SteelSeries QcK+ which is the largest version and the QcK being the normal sized are both micro-woven cloth, with a high thread count (like decent towels) which is meant to improve accuracy and traction across the surface. Combined with a non-slip base, it should be a pretty decent area to rest your mouse on, keeping stuck to the desk and glide like a bird. There are a plenty of different sizes of the QcK range has to offer that you can buy, in the Limited Edition range you have the option of two. The one we liked the most was the QcK+ which measures 450mm x 400mm x 3mm, having more space than needed meant you never really had to worry how far you fling your mouse on the desk. The just as impressive QcK Limited Edition is 320mm x 270mm 3mm is more your usual sized mouse mat. Bigger does not always have to be better, if you have a smaller desk or are a high-sensitivity mouse user, wider surface area may be extra cash you don’t need to spend. In the Limited Edition range, the difference between it and the standard QcK range is the thread count. SteelSeries say themselves on the website “…this allows for better sensor tracking due to the cloth fibers being in a closer proximity.” For this reason, with more fibres packed closer together there is more “surface” on a microscopic level for the laser to bounce off. Trying both the mouse mats out in Battlefield 1, I could notice a difference in friction between this mat and my previous one which was a SteelSeries QcK Frost Blue. That worked well, until I compared it to the QcK Limited Edition, the latter was just much smoother and ‘felt’ more accurate. Combined with tweaking my settings in the Rival 500, I could achieve a nice balance between being smooth, accurate but quick for those flick headshots when sniping. Switching out the Rival 500 for a Logitech G602 and swapping my sniper rifle for a hook and shotgun in Overwatch, the results where the same with a different mouse. Out of the box, the QcK and QcK+ worked perfect, a harmony of woven threads creating smooth, uninterrupted mice strokes. Each game and mouse that I tried, a couple others being the Rival 700 with Diablo III and the Razer Mamba with Darkest Dungeon, I really could not fault it. There is not much that can go wrong with mouse mats but some can be poorly made. They can become textureless very quickly, they slip around or they fray but the QcK+ Limited Edition after almost a months continuous use (9+ hours a day) still looks new out the box. In the end, for £20 for QcK or £25 for the QcK+, if you are looking to upgrade your cloth mouse mat or want to improve your game a little and stop using just your desk. The SteelSeries QcK and QcK+ for a mousemat set to do a single job are perfect. 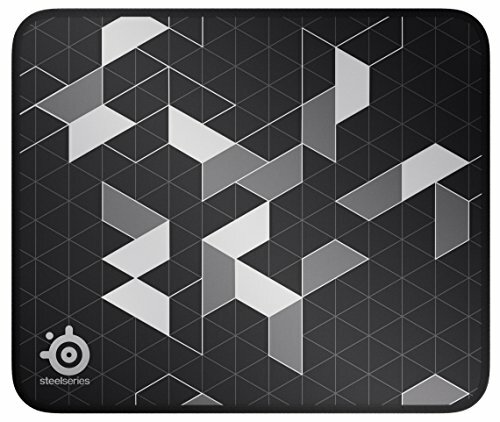 SteelSeries QcK+ is a mouse surface woven in heaven by the angels for £19.99 just buy it. You won't regret it.